I think this is the first piece I’ve written on my blog that is tagged only “beer”; apologies to my readers who don’t care about such things (there are feeds for PHP and Web as well, if you’d prefer to avoid the occasional post on beer geekery). I love a good berliner weiße beer. For those of you that haven’t had the pleasure of enjoying a glass, it’s a very light and refreshing, sour and acidic, low alcohol beer. It’s as acidic as lemonade, and low enough in alcohol that the Germans even occasionally refer to it as children’s beer. I’ve found a few examples in bottles (while travelling), but it’s very rare that I find a good berliner weiße on tap, and even more rare that the one on tap is pouring properly (they’re usually under-carbonated, really yeasty, and they pour all foamy). I prefer mine straight (“ohne schuss”), but they’re traditionally (at least for some values of traditional) consumed mit schuss — that is, with either raspberry (“himbeersirup”) or woodruff (“waldmeistersirup”) syrups to balance the lactic, yogurty sourness of the berliner weiße base with sweet fruity flavours. If you like sour, I highly recommend you try it all three ways, if you’re ever given the chance. A few years ago, before I’d ever even had my first taste of berliner weiße, I was listening through Jamil Zainasheff’s radio show wherein he described all of the different BJCP styles, and gave hints on how to brew each of them. A few episodes were exceptionally helpful, but the one on berliner weiße really resonated with me. As a result of this good advice, and some experimentation on my part, I recently won a gold medal in competition with my berliner [style] weiße (the sour raspberry version of the same beer also won a silver). The sourness in my berliner weiße comes completely from the sour mash. In most other sour beers (such as lambics, flanders red, gueuze, etc. 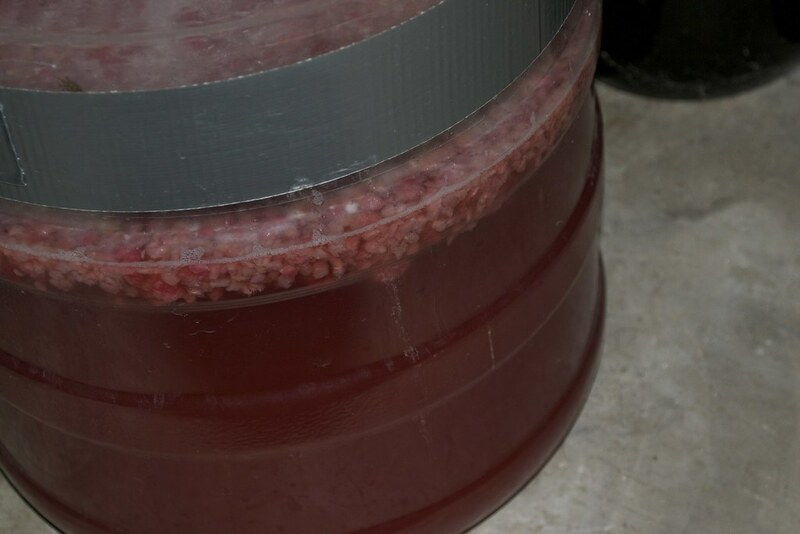 ), the sour components are yeast- and bacteria-derived after the boil as part of the fermentation process. In mine, all of the lactic sourness is in the beer before it’s boiled. The mash was mostly normal, but I kept it very thick. More on this later, but I added water over the next couple of days to help control the temperature, so thicker is better. Luckily, this is such a low-gravity beer that it’s easy to make a thick mash without it being “too thick” for efficient conversion. I let the mash convert fully, but instead of lautering into the kettle, I just cooled it down to around 40°C, which is close to the optimal temperature to grow lactobacillus. With the extra pound of 2-row stirred in, and the undrained mash sitting at around 35°C, I flooded my mash tun with CO2 (from a tank), sealed it up (my mash tun is a cooler, so it holds temperature pretty well), and put it in a warm place. In my experience, you’ll want to taste the mash every 8 hours or so to see how it’s progressing. Every time you do so, you should measure the temperature, and if it’s much below 35°C, add some boiling water and stir to get the temperature back up to the range where the lacto is most healthy. Remember to flood the tun with CO2 again after you’ve tasted and stirred. You probably won’t want to taste the mash. It smells horrible. Really horrible, but there’s really no other way to test it that I know of. 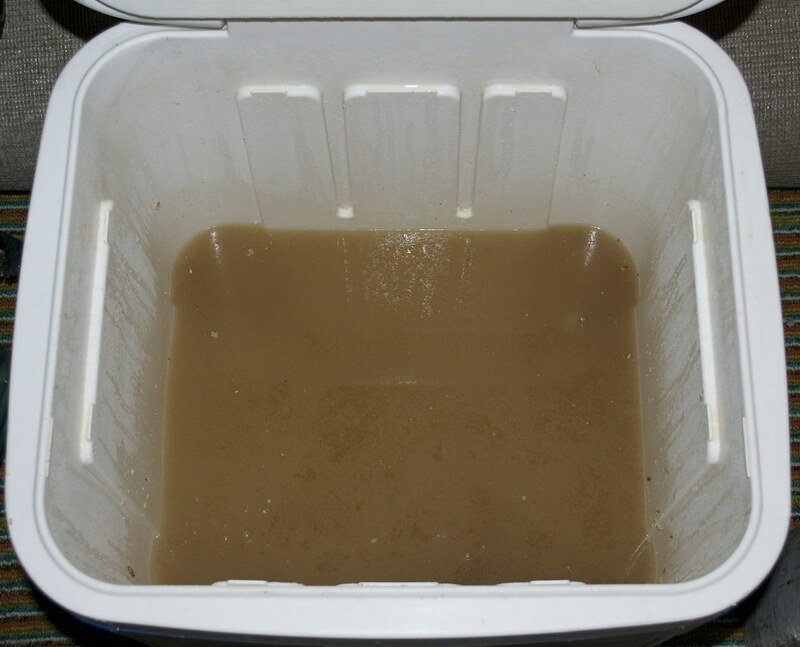 (If you’ve ever thought that it might be an OK thing to leave your freshly-used mash tun for a day or two before you clean it out, you know the horrible smell I’m describing.) You could probably measure the pH of the liquid and consider it “done” when it gets low (acidic) enough. Really, though, you should taste it. It won’t hurt you, and it’s good to know what the components of your beer taste like. To be honest, it tastes much better than it smells. The reason I suggested a thick mash, above, is that these boiling water additions (to get the temperature back up to ~35°C) will thin out the liquid. If you’ve accounted for this, it’s fine. You could also use a more active heating method (such as heating the whole thing up in a pot, or drawing off some of the liquid and boiling that), but the infusion technique seems to work pretty well for me. Personally, I sour the entire mash: grain and liquid. 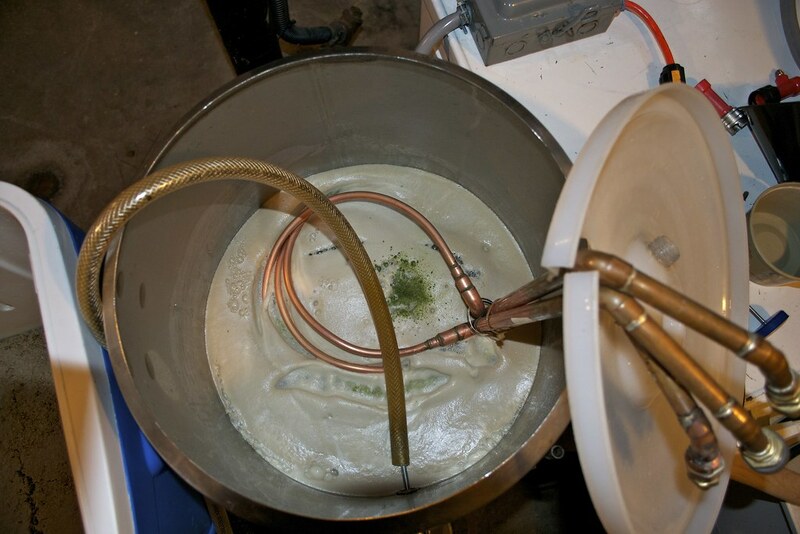 Some brewers will sour part of the liquid from the mash, and blend it back to the unsoured portion of the (refrigerated or pasteurized-by-boiling) mash liquor to get an exact blended flavour. This technique probably works just fine, but the full-sour method worked for me, so I just went with that. The reason I flood my mash tun with CO2 is that the lactobacillus works anaerobically — that is without oxygen. I’ve heard that keeping oxygen out of your wort will promote the growth of lactic acid (and other lacto-derived components), but will prevent the “bad bugs” from taking over your wort. I haven’t had much experience with “bad bugs” in this process, myself, but I have noticed that the mash gets a lot less ugly if I’m more zealous with my application of CO2 to reduce oxygen in the mash tun during souring. After around 48 hours (in my experience), at over 30°C, tasted every 8 hours or so, the mash will be soured enough to resume brewing. I recirculated and ran the liquid from the mash into my kettle, as normal. I heated the wort to boiling as normal, except, since this will be a short boil, I put my immersion chiller directly into my kettle right from the start (I normally add it with 15 minutes left in the boil, to heat-sanitize). 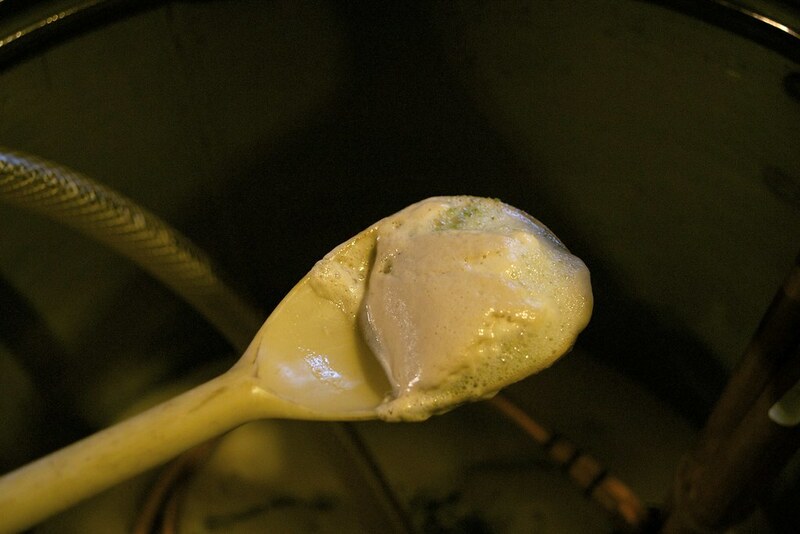 Be very careful with this wort as it climbs to the boiling point. It will boil over, and it will do so spectacularly, if you’re not attentive. For some reason (perhaps starch or protein from the unconverted, additional, souring malt), the hot break foam on this wort is unlike any other I’ve ever seen. It is thick and gelatinous. It’s almost like meringue. The hop addition stayed completely on top of the foam until I stirred it in. Traditionally (again, for some value of traditional) berliner weißes are either boiled for a very short amount of time, or not boiled at all. I decided to go for a 15 minute boil to arrest (kill) the lactobacillus and to sanitize my chilling equipment. 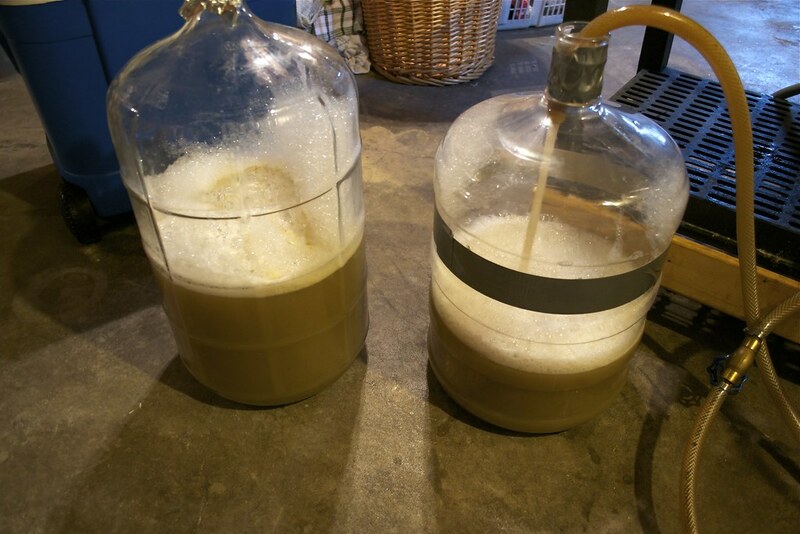 After boiling, I fermented normally with a clean ale yeast (WY1056 or WLP001 work just fine). It’s a low-gravity beer, so it ferments out very quickly (even though it’s far more acidic at this point than most other worts you’d attempt to ferment). It’s super ugly going into the fermenter, and not much prettier when fermentation is complete (a very few days later). I can go from grain to glass (including two days of mash-souring) and one night of chilling and forced carbonation in just six days. 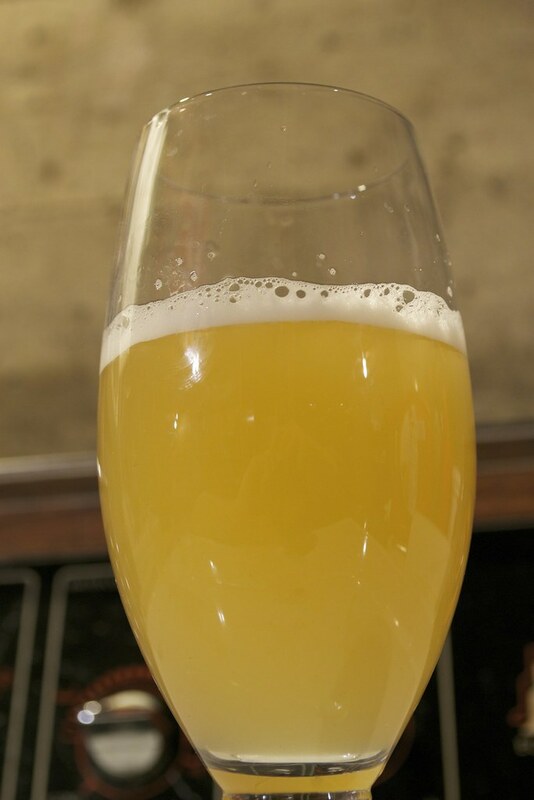 One of the nice things about using the clean-yeast, sour-mash technique is that post-boil, this beer can be treated mostly just like a normal ale. 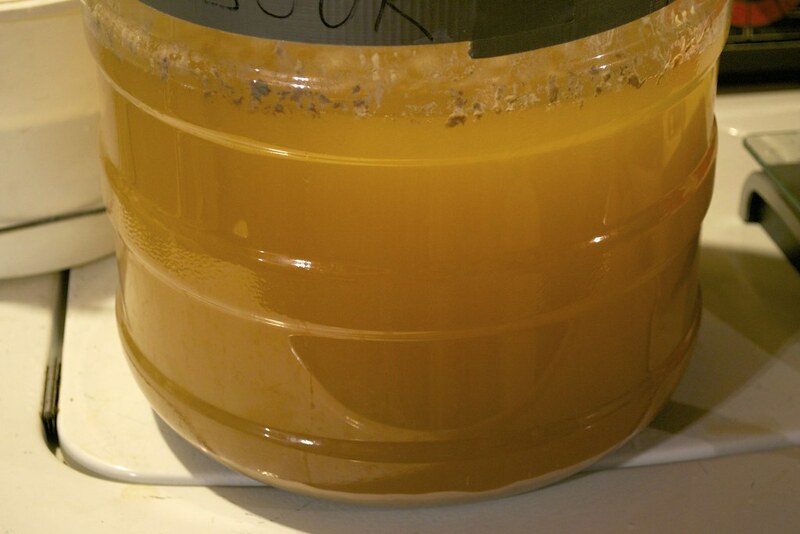 You don’t have to worry about it “infecting” your equipment because it’s just acidic; it’s not actually still full of lactobacillus because we killed that off in the boil. This past year, I wanted to try making my berliner weiße into a fruit beer. The previous summer (when they were at their peak), I went to the market and bought a kilogram of fresh raspberries and froze them. After fermentation was complete, I racked half of the beer onto the kilo of raspberries (still frozen), and let them sit there around for 10 months (I didn’t intend to leave it on the fruit for so long, but life got complicated). By the next morning, the beer had taken most of the colour from the berries, and left them white (and the beer red). I think the acidity of the finished beer prevented further infection that would normally take place from unpasteurized fruit. When you’re done, you’ll have the most delicious, most refreshing, sour-like-lemonade, lawnmower beer that you can imagine — at least if you like that type of thing. If you’re really lucky, you might even end up with a gold medal. Update: James from Basic Brewing Radio was kind enough to have me on his show (the July 26, 2012 episode) to discuss this article. Check it out.